This information on overseas dental care is provided by MedTrava, medical tourism experts. MedTrava’s represented dental centers offer many procedures, including prosthetic dental care, oral surgery, oral pathology, and preventive care. Expensive dental procedures like implants and crowns can be performed abroad for a fraction of the cost you would pay in the U.S. The dentists in MedTrava’s network are qualified to perform almost any dental procedure you might need. Orthodontics -- braces and the repositioning of teeth. Pedodontics -- care exclusively for children and teens. Periodontics -- care of gums and supporting tissues. Prosthodontics -- dentists specially trained for full mouth rehabilitation. 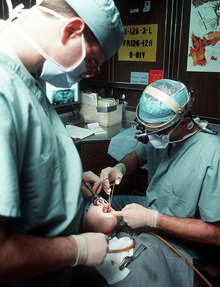 This information on dentistry abroad is provided by MedTrava, medical tourism experts. Prevention and early detection of problems are the best ways to ensure dental health. Regular checkups, cleaning and maintaining healthy gums and teeth, controlling plaque and tartar buildup will aid in the fight against gum and dental disease. Following a proper diet and maintaining proper dental hygiene with brushing and flossing is important. Modern dental technology can help everyone achieve the appearance of a healthy set of teeth. If you are missing any teeth, prosthetic dental care can replace your missing teeth with implants or dentures. Replacing your teeth is important in order to prevent damage shifting to your remaining healthy teeth. Prosthetic teeth will provide you cosmetic confidence, as well as prevent tissue damage in the mouth, improve your speech, allow proper chewing of food, and provide support for your lips and cheeks. Dental implants - Dental implants are artificial teeth designed to replace lost teeth. They are the most effective and durable option for the treatment of missing teeth. They are among the most successful dental procedures performed, with a 95% 5-year success rate for lower jaw implants and a 90% success rate for upper jaw implants. Today's dental implants are virtually indistinguishable from other teeth. A dental implant is commonly composed of a titanium material screw and a crown. A small-diameter hole is drilled at jaw sites with no tooth in order to guide the titanium screw that holds a dental implant in place. After the implant screw is placed, a protective cover screw is placed on top of the implant. Implants are typically placed in a single sitting but require a period of time to anchor to the jawbone, which will take between three to six months. After the implant has anchored, the protective cover will be removed and a crown will be placed over the implant screw. Tooth extraction - Most often dental extraction is done for impacted wisdom teeth, tooth decay, or if there is gum disease causing problems to the tooth’s health. Dental extraction of teeth is also done in preparation for other treatments such as orthodontic care. For affordable Dentistry overseas, Register with MedTrava now or call 1.877.My.MedTrava. MedTrava is dedicated to connecting patients to world-class healthcare abroad at affordable prices. Click here to read testimonials of some of our patients who have received medical treatment abroad.